After dropping off David Bowie's Outside Tour Morrissey traveled to Japan to resume promotion of his "Southpaw Grammar" album. As on the Bowie dates, the typical tour outfit for Morrissey was a suit two sizes too small and the 1 oz necklace he is seen wearing on the back of the "Vauxhall & I" album. Personnel was Boz Boorer (guitars), Alain Whyte (guitars), Jonny Bridgwood (bass) and Spencer Cobrin (drums). There was no opening act on these dates. - Shirts and posters, possibly the same ones sold on the recent Outside tour, plus a long sleeve shirt showing the artwork to the "World Of Morrissey" album. - A poster-gramme (programme that unfolds into a poster) unique to Japan. When unfolded, one side shows the Morrissey photo used on the cover of the "Vauxhall & I" album while the other side combines various Morrissey photos (Griffith Observatory, Skinners Arms pub, photos found inside the "Southpaw Grammar" LP booklet, etc), with the four tour dates and credits (view). - Beanie style cap unique to this tour (image needed). The intro tape is unknown but probably was very similar to the one from the Outside tour. Cornelius Carr, except on the first date where there was no backdrop because of the size of the venue. Morrissey wasn't opening for David Bowie anymore, so the setlist was extended to fifteen songs on the first three dates, and sixteen on the last one. It was still a slightly shorter setlist than what Morrissey usually played at the time, but the Japanese fans were treated to two encores, something Morrissey didn't do anymore in 1995, and hasn't done very often since. Newest album "Southpaw Grammar" was still represented by the same six tracks than on the Outside tour. "Do Your Best And Don't Worry" was the usual set opener, with "Reader Meet Author" not far behind (except in Ebisu where that song was dropped). "The Boy Racer", "The Teachers Are Afraid Of The Pupils" and the pair of "Dagenham Dave"/"The Operation" were the other songs from the album being promoted. The lesser known "Southpaw Grammar"-era b-side "Nobody Loves Us" wasn't performed. "Billy Budd", "Spring-Heeled Jim" and "Speedway" were again "Vauxhall & I" regulars. "Now My Heart Is Full" was performed on the last two nights while "The More You Ignore Me The Closer I Get" was added to the typical Outside tour setlist when it replaced "We'll Let You Know" from the second night to the last. The deletion of the latter song from the set left "The National Front Disco" and "You're The One For Me, Fatty" the only ones to represent the "Your Arsenal" album. The latter was a new addition to the Southpaw Grammar setlist, it hadn't been played on the previous leg promoting the latest album. "Suedehead" was another song added to the Outside tour setlist. It was the only solo song in the set older than 1992 and hadn't been performed since the Your Arsenal tour. The lucky Japanese fans were treated to two encore songs, and "Suedehead" was always scheduled as the first one. It was always followed by set closer "Shoplifters Of The World Unite", one of two Smiths-era songs in the set, the other being "London". Here is the number of times each song was performed on this leg, in descending order of frequency. This is based on 4 concerts. "Do Your Best And Don't Worry" was the standard set opener on these dates, and in it Morrissey sang "the way you hang yourself" instead of "the way you watch yourself" and replaced "you on a pale day" by "you in a drab dress". "Reader Meet Author" was sometimes made more personal by singing "have you ever escaped from a Manchester life?". In previous live performances of "The Boy Racer", Morrissey usually sang the more family-friendly line "and I'm gonna tell him" but in Japan he reverted to the studio version's "and I'm gonna kill him". In "The Operation", which as before segued straight from "Dagenham Dave", Morrissey sang "you don't catch what I'm saying because you're deafened to advice" and changed "You say pleasant things" to "You say kind things". In "Speedway", the intro lines "And when you slam down the hammer can you see it in your heart?" were dropped and Morrissey sang "when you try to break my spirit, it just won't happen". He sometimes sang the studio version's "all of the rumours keeping me grounded" and sometimes the alternate "all of the rumours leaving me grounded". In "The Teachers Are Afraid Of The Pupils" Morrissey slightly stretched a line to "and in fact you think it's essential". But more importantly, the two verses starting with "Say the wrong word" were dropped so the live version wouldn't last 10 minutes like the song does on "Southpaw Grammar". However the sample at the end wasn't dropped. 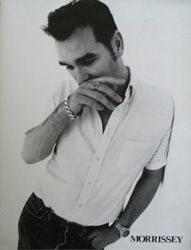 In "Now My Heart Is Full", Morrissey sang "I was tired again" instead "I'm tired again". Usual set closer "The National Front Disco" was moved up to the position of last song before the encore break, and as he always did on the Your Arsenal tour or the Boxers tour, Morrissey changed a line to "Ah, have we lost our boy" and skipped the title, the "Ah, then you might do" and the "When you've settled the score" lines. The song also still ended in a blinding chaos of feedback and lights at end of which Morrissey usually sent his shirt into the crowd. Finally, in "Suedehead", a line was slightly changed to "Still it was a good lay". None of these concerts are circulated on bootleg video at this point in time. Audience recordings of the latter three dates of this visit to Japan are circulated on bootleg cds and on the internet. Sound quality is generally not very good for either of them. The final date in Tokyo has the longest setlist, including "Reader Meet Author" which was not played in Ebisu and "Now My Heart Is Full" which was not played in Kawasaki, so it might be the most interesting option to the casual collector of bootlegs. But then, the casual collector may also want to look into shows of the previous leg for better sounding options with similar setlists. A recording dated 13 December is circulated on the internet, but this is actually the 17 December Tokyo recording. At this point in time, nothing is available for 13 December.